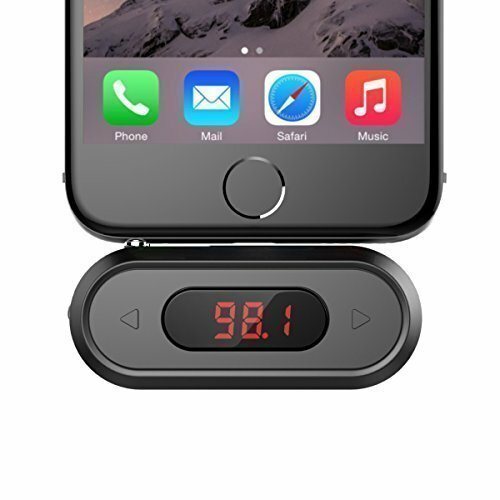 FM Transmitter, compatible with iPhone, iPad, iPod, Samsung, HTC, MP3, MP4 player and most devices with 3.5mm audio jack. Built-in digital tube display, easy to read and won't cause distraction in car; Left and right buttons to adjust FM frequency, convenient to use. Doosl FM Transmitter Features: Listen to your favorite music on your car stereo Easy-to-read digital display Convenient to control The last FM frequency memory function Built-in soft light, will not cause distraction in car Hand free calling for safe driving 300mAh rechargeable battery, up to 10 hours playback Specifications: Effective Range: approx. 15ft Frequency Range: 88.1-107.9MHz Power Supply: inner 300mAh Li-Battery charging via Micro USB cable Operation Time: up to 10 hours (built-in battery) music playback Charging InputDC 5V Dimensions: 622514 mm Package includes: 1 x Doosl FM Transmitter 1 x User Manual 1 x 18 months Warrenty Card FAQ: 1 How do I run the Doosl FM Transmitter? Simply operate the FM transmitter by following three steps: 1. Turn on your car stereo and select a blank and clear frequency which iswithout any interference from 88.1-107.9MHz. 2. Connect the Doosl FM Transmitter with your device via 3.5mm audio jack,and adjust to the same frequency as the car FM radio. 3. Now enjoy your favorite music! 2 must often changed channels for not sizzling? 1. Be sure to find empty stations manually or websites such as Radio-Locator.com and SiriusXM.com. Just type in your zip code or lieu.Essayez eachstation to determine which one offers the best sound quality. 2. Make sure the volume is good, the volume to about 3/4 seems to work bestwith FM transmitters. 3. Under the law, we do not allow to improve the signal, it is more difficultto find an empty station in the city.